As you know, just before the picnic we squeeze in the Breakfast Talk session at 10 AM. It is always fun and honest. At the previous picnic, we had Max Lichaba. Before then we had Irfan Pardesi. This time the Breakfast Talk session @ 10 AM will feature a panel dissecting the real struggles and anxieties that come with entrepreneurship – the stuff that is kept hush-hush. The panel includes: Lunga Ncala – Startup Picnic MC, broadcaster, #RideAbuse founder/cyclist and marketer; Tendai Joe – Tendai Joe is a Zimbabwean born, Pretoria based digital publisher and tech entrepreneur; Mark Makhubalo – entrepreneur in mining, property, entertainment and consulting; Kelahloko Mashiloane – geologist turned business and leadership consultant, founder of K-Elixir Consulting; Tebatso Molapo is a social media marketing entrepreneur and founder of Re Basadi (www.rebasadi.co.za) – which focuses on the empowerment of young female entrepreneurs through events & digital content. STARTUP PICNIC is a picnic for entrepreneurs to unwind, relax, braai, have drinks and NETWORK. 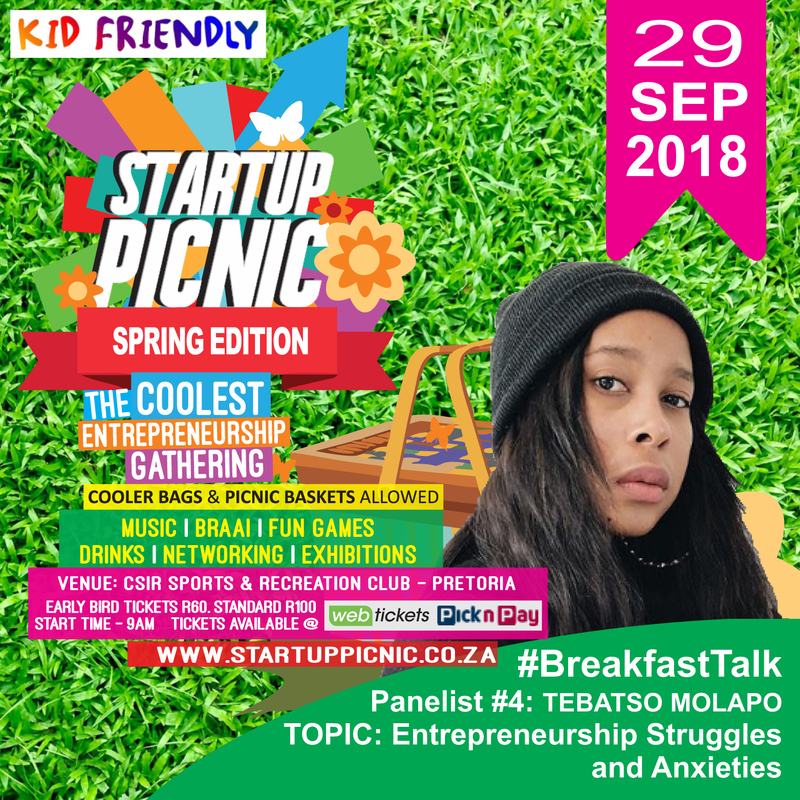 STARTUP PICNIC Spring Edition takes place on 29 September 2018 at CSIR Sports & Recreation Club. Early bird tickets are R60 and standard tickets are R100. Get your tickets at Webtickets.co.za https://buff.ly/2KxNPL2 or Pick N Pay stores. Gates open @ 9:00 AM.